Here’s a lucrative deal for all government job aspirants. 2000+ vacancies are open for recruitment. Before the jobs expire this weekend (06 November), do not waste a minute and submit your online applications. 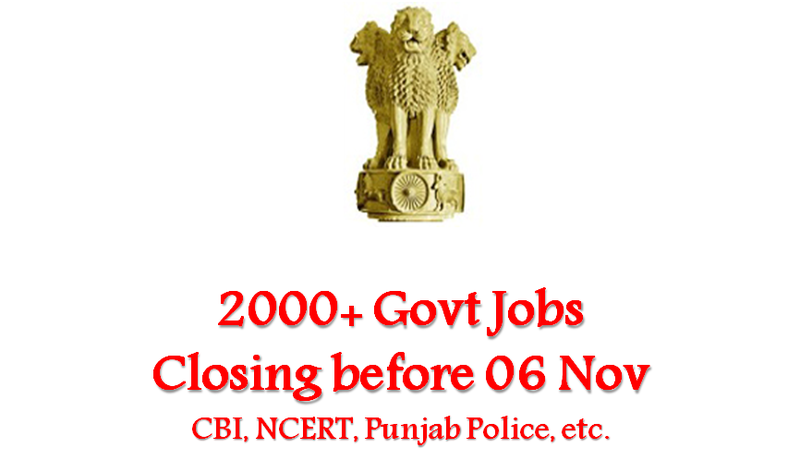 Punjab Police is closing down its online application portal for 750 Constable (driver) vacancies. Similarly recruitment process is nearing an end for State PSCs of Andhra Pradesh, Himachal Pradesh, Jammu and Kashmir, Sikkim and Gujarat. Railway job aspirants under Sports and Guide Quota should start submitting their applications right away for Group C and Group D posts. Apply for CBI (Inspector of Police), NCERT (Administrative posts) and vacancies in leading public sector undertakings as well. Vacancies are also available under various State governments as well. Aspirants can find detailed information from the table given below.